How long is that song? Each colored marker in the Act 2 image is given as the coordinates found on a computer screen. As you prepare the lesson, anticipate how students will convert the distance between the markers to the accurate time. Consider possible errors that students might make. Where will the marker be when the song is 90% complete? Where will the marker be when the song is 75% complete? Where was the marker when the song was 5% complete? Where will the marker be when the song is x% complete? Can students write a rule for the location of the marker, given either the percentage of the song complete or the time elapsed? How old is this song? How many seconds long is Thick as a Brick (Side 1)? How long to listen to the entire thing? Really don't mind if I sit this one OUT? Exactly what is thick as a brick? How thick is a brick? I can hear a newspaper? How many times could you listen to this song during class? What is the density of a brick; how dense is my head? What is thick as a brick? Why did they come up with such? How long remaining in the song? Just how long is that song? What does that little boy have to do with a brick? What's the program looks like makes the progress bar keep time and in proportion with the remaining song? How thick is the brick ? I wonder how many of us actually saw this in concert? I did. How thick is the brick? 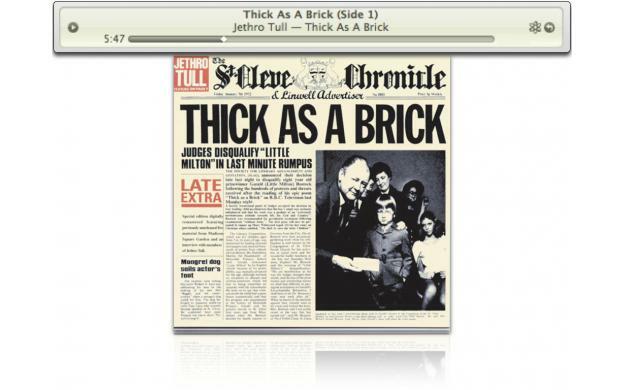 why are they called Jethro Tull?